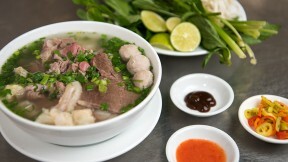 Get the Cha Ca La Vong recipe featured in Family Ingredients on PBS. Noodles:Cook noodles per instructions on package. Drain, rinse and cool. Herb Mix: Mix all the herbs together, reserve. Fish Marinade: Blend everything in the fish marinade together until smooth. Be sure to marinate fish for at least 4 hours, overnight preferred. Once marinated, take out and remove excess marinade. On medium heat, heat up a sauté pan with enough grape seed oil to cover the bottom. Once oil is hot, carefully put in the fish and cook for 3-4 minutes on each side till golden brown. Once browned, take out of pan and reserve. Mam Tom Sauce: Blend pineapple, garlic, ginger, mam tom bac, sugar, lime juice, fish sauce and coco rico till smooth. Add the sambal and mix well. Store in refrigerator. VERY IMPORTANT to do this 1-2 days in advance for the flavors to develop and funk of the fermented shrimp paste to mellow out. To Finish: Arrange the vermicelli noodles in a bowl. Place the cooked catfish on top. Sprinkle a spoonful each of fried shallots and roasted peanuts. Spread a generous amount of the herb mix on top and serve with the mam tom sauce on the side.